Project Vesta experimental fires, 4/3/98, Dee Vee Rd, WA. 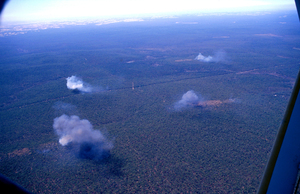 Aerial photograph of simultaneous experimental fires five minutes after ignition. Fires are burning in different aged fuels; clockwise from top right -- 8 year old, 19 year old, 5 year old, and 2 year old.